The apartment was built in 2009, in a residential and tourist area of Ližnjan. Located on the second floor, modern and functionally designed to be able to accommodate 5 people. Apartment consists of two bedrooms, a bathroom with a toilet, a fully equipped kitchen (2 ceramic hob, microwave, coffee maker, toaster, electric kettle) large dining and living area with a sofa bed for two (1, 60 m wide). 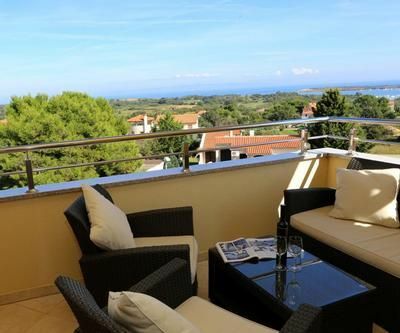 Satellite TV, wireless internet, washing machine, dishwasher, air conditioning with the function of cooling / heating, terrace with furniture and magnificent sea views, parking. The neighborhood is very quiet, restaurants and shops are at 50 to 100 meters away, while the nightlife is just 3 kilometers away. Beautiful beaches and crystal clear sea. Nearby is a beautiful island with a sandy beach ideal for children. Available is all that is in the apartment as well as a bicycle storage.